Here is an application for the 180-degree turn into the front stance inner-forearm wedging block (aka opening block) after the first "knee break". I don't interpret the latter as an actual knee break. It's true that this technique appears in older karate manuals, but the breaking palm should be in front so as to apply more pressure. See the technique shown by Kenwa Mabuni below. But in Koryo the downward palm comes from the back hand. I believe this variation works better as an irimi nage (entering throw) technique. The front palm pushes in the small of the opponent's back while you throw the opponent's head to the floor. Perform after using the preceding front kick as a kick to the groin. This throw may fail if the opponent steps backwards to maintain their balance. Since you are pushing in their left side with your right palm, they will have to step back with their right leg. Grab their left leg with both fists. Then step through and turn while pulling up the leg with the inner-forearm wedging block, tripping the opponent over your rear (left) leg. This is shown in the gif below. Even though I am ITF-trained, I'm rather fond of the KTA poomsae Koryo and have been studying applications for it recently. The most baffling part is the back leg double side kick performed early in the form. Koryo's ready position and opening guarding block have a simple application that is, I think, fairly well known. It comes from the karate kata Kushanku. After using the ready position as a guard to defend against any kind of swinging attack (haymaker, front bear hug, headlock), overhook the opponent's arm while striking the side of their neck. This is an old, perhaps the original, application for the guarding block. It appears not only in traditional martial arts but modern self defense systems. A live demonstration by Tony Blauer (as part of his S.P.E.A.R. system) is shown below. It can be used against a haymaker, front bear hug, or tackle. By pushing out on the opponent's neck you prevent them from striking or hugging you effectively. You can also throw in some quick hand strikes or knees from this position. In some ITF forms, a front leg front kick is used. What you cannot do is the double side kick. There's no way to realistically apply it from this close a range, and why use it over simpler hand strikes? However, I don't think the two kicks are meant to be used from this defensive position, but rather as your opponent escapes from this position. Applying pressure to the side of the neck is uncomfortable and once the opponent realizes they can't take you down, they may dive away from your knifehand. 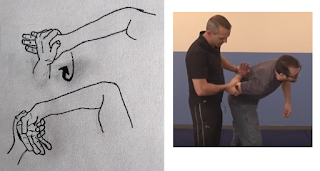 (1) Since you have an overhook, you have tactile information that their arm is slipping. (2) Lock their arm with both hands as you turn 180-degrees stepping forward. (3) Perform the low side kick to the side/back of their knee. This will cause them to collapse onto that knee, lowering their head. (4) Perform the second side kick to the back of their head. Pull the arm back while kicking for greater damage. I have one more application from Koryo that I will discuss in my next post. 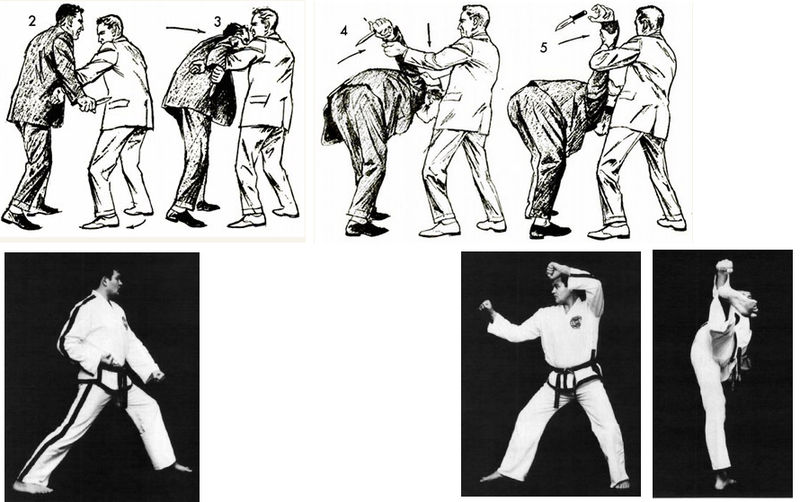 Here is another application for the supported elbow strike followed by the low target hammerfist in Koryo. Assume the opponent grabs your lapel. Use the downward palm to cover and grab their knifehand. Twist their wrist as you bring your elbow over their elbow, creating a Z-lock (aka S-lock or nikkyo). Pushing their wrist towards them will force them downwards. The Z-lock works by preventing the opponent's elbow from rising as you push their wrist towards them. Since it can't rise, the lock forces them downwards. Step in close and follow with the low target hammerfist to the head. I used to think that slow motion movements were grappling techniques, but often I see the opposite in forms: normal motion movements can be grappling while slow motion movements can be strikes. Slow motion movements may either be for aesthetics or to indicate that something non-obvious is going on. To summarize part 1, the sets in taekwondo forms are a mix of self-defense ideas taken from early 20th century Judo, karate manuals, and the creators' own ideas. This means that each set has an intended meaning behind it; and forms are not ambiguous collections of movements meant to be interpreted as the student desires. This is not to say you cannot apply sets in other ways -- instructors can and do -- but the forms still have intentional meaning. 1) Expository Value: Does the application explain the movements in the form? What about footwork, stance, the secondary hand, or special instructions? 2) Practicality: Would this application work in a live context against a realistic attack? Does it adequately protect the user? 3) Continuity: How does this application fit in with the rest of the form? Because of this criteria, the number of feasible applications is quite small. It's true that an individual movement, such as the low block, has many uses, but once you put that movement in a greater context its possible meanings shrink. front stance would serve this application better. This also means that we should not have to add footwork, change stances, change open-handed movements to grabs, etc. to make an application practical. We should trust that the creators of the forms made them the way they are for a reason. This is also why it's important to study the official versions of the forms, as they tend to pick up changes as they get passed from school to school. Rather than find multiple applications for a given set in a form, it is more useful to find that set's intended application and then that technique's applicability. 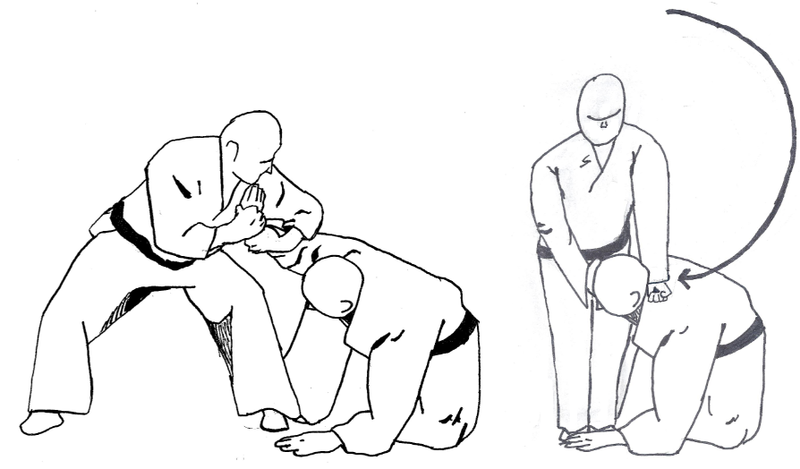 Suppose you agree that the twin upward palms in Choong-Moo encodes a double leg takedown. Rather than try to explain how the motion could also be a double elbow lock, or a release manuever, it's more useful to train the double leg with a partner, discover new entries to the technique, how to counter it, what to do if it fails, etc. For the record, I am not saying that I know what all the original applications are, that interpreting forms is easy, or that you cannot use alternate interpretations. What I am saying is that if we look for the historical meaning, then there is ultimately one correct interpretation. Studying older versions of the forms can be useful in determining their meaning. The original 20 ITF forms underwent minor revisions between Choi's 1965 book and his 1983 Encyclopedia. Are the updated forms better or should we use the original versions? Most of the changes do seem to have a purpose. The X-fist pressing block in Sam-Il was originally performed turning 90-degrees to the right; in the modern version you turn only 45-degrees. It's hard to believe this change was made for aesthetic reasons, but when you know the application then the change makes sense. The twin block set in Hwa-Rang was changed to take advantage of the new cross-arm setup. Tong-Il underwent significant revision between 1965 and 1983, seemingly to make it more challenging, but the 1983 version is nonetheless logical in design. To me, the revisions are evidence for rather than against the existence of applications. However, some of the changes are a side effect of changes in hand techniques. 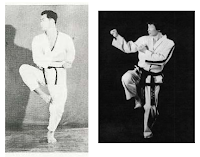 The first five forms presented in Choi's 1959 book use the Shotokan karate low block setup. By the time the original 20 forms were finished in 1965, the wrist-to-wrist setup was being used. Between 1965 and 1983, the bending ready stance was changed. Originally one would bring both fists to the opposite hip -- as in karate and KTA taekwondo -- but this was changed such that both arms extend outward. While these changes do have applications (e.g. the wrist-to-wrist setup is brush-grab-strike),  application researchers should keep in mind what the original versions of the forms were. Reading through these two posts, you might be getting the impression that forms are mostly grappling techniques, but that isn't quite right. The dichotomy between grappling arts and striking arts is a modern one. Most historic arts taught both striking and grappling before they became specialized over time. Even Western boxing used to allow limited grappling. The folks at Karate Culture have described karate as the art of "striking while being grappled", and we can say the same about taekwondo forms. Punches are still punches even if we pull the opponent with the other hand. Backfists, hammerfists, knifehands, elbows, knees, kicks, and throat strikes are found throughout the forms. Even the basic blocks may at times be used as strikes: the low block becomes a hammerfist to the groin; the inner-forearm block, a rolling backfist to the face. General Choi stated that of the three self-defense options against a grab -- striking, releasing, and joint breaks -- striking was the fastest and most likely to work. Hwa-Rang and Choong-Moo, despite the Judo influence, both begin with a prosaic block followed by a strike. But because you are likely to be grabbed in a self-defense scenario, it is important to actually know how to grapple. Most sets in forms end in takedowns; sets that do not usually end in striking the vagus nerve or back of the head. Locks, while present in forms, are rarely to submit an opponent. They are instead used to break a joint or to position an opponent for either a takedown or a knockout strike. This post assume the reader has the basics down: that "blocks" are not always blocks, that you face only one opponent, and that as a rule both hands are utilized. Therefore, I wish to cover some non-literal instructions in forms that students should be aware of. Although stomping is sometimes used to attack the leg, more often it represents lifting your leg for a knee strike, rapidly dropping your weight, or both. A downward elbow strike is an overlooked application for the mountain block/W-block. 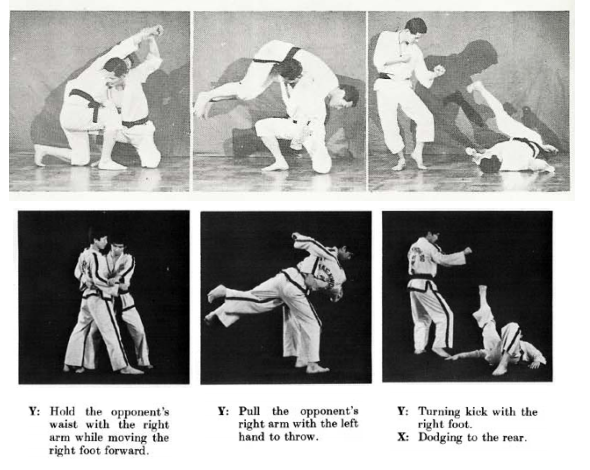 from the Encyclopedia of Taekwon-Do. Stances can have special uses. Front foot X-stances are typically used to trap the instep. Rear foot x-stances can represent leaning onto your opponent. Cat stances are often trips. One-legged stances can be knee strikes or sweeps. Even the front stance may be used to destabilize an opponent by pressing your front knee into their leg. Jumps have varying purposes. The 360-degree jump in Choong-Moo represents lifting an opponent from a squatting position, and hence is not literal. But in other forms an upward jump may be used to complete a joint break or to get at the top of the opponent's head. Finally, kicks in forms are usually aimed at the legs, even "middle" and "high" kicks. A low kick indicates that the opponent's leg is very close to you. Several forms have a special ready position. With the possible exception of Juche, these ready positions always have an application, but not always at the start of the form! The intended meaning is just as likely to be at the end of the form instead. One example of this is in Cheonkwon. Suppose you cannot apply the mountain pushing posture as a trip and face push because the opponent backs away from you. If the opponent does this, then they have straightened their leg. We can hoist their ankle onto our shoulder and push down their knee with both palms, taking them to the floor. 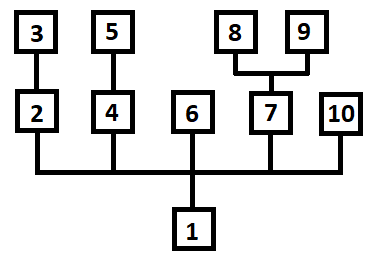 Because this is meant to be used if the previous application fails, it is an example of a chain sequence. In contrast, I struggle to find a use of the overlapping hands at the start of Cheonkwon. I do not believe there is one. An example from the ITF forms is the covered fist at the end of Won-Hyo. 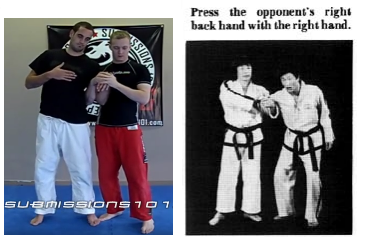 This may be utilized as a gooseneck wrist lock, another technique that appears in General Choi's books. Ready positions occasionally appear in the middle of forms, such as in Ul-Ji and Taeguek 7, further supporting that they have applications. Sometimes the applications in a form are built around a theme. In Hwa-Rang we control the opponent's arms. In Choong-Moo we attack the base. In Ul-Ji we attack the head. The nine (or ten) KTA black belt poomsae have thematic elements as well. Koryo relies on hard and fast striking. Keumgang emphasizes stability. Taebaek is based on the Heian kata. Themes are never universal, however, and I doubt that every form has one. While knowing the theme can be useful for discovering applications, it is easy to guess the theme wrong. The internal logic of the form is more important. Finally we reach the climax. Just what is the internal logic of a particular form? Keep in mind that not all forms are designed using the same rules. This is especially true if you study a style which uses forms from many different creators and time periods, such as karate. The scheme I describe below just happens to work for many ITF forms, and has proven useful for analyzing the KTA black belt poomsae as well. In engineering we have a maxim that "all models are wrong, some are useful." I cannot say with 100% certainty that the below models of Hwa-Rang and Choong-Moo are true, but they have proven useful for analyzing both of the forms. The general rule is this: in a taekwondo form, you only ever defend against one de novo attack from one opponent, at the start of the form. Every other set in the form is an alternative follow-up or a chain sequence. This means that you have the same opponent throughout the entire form. Chain sequences are to be used if the opponent counters you in some way, and thus the application depends on how exactly they counter you. Hwa-Rang, in my view, is mostly alternative follow-ups. Suppose at the start of the form we parry an opponent's right hand punch, and then counter with our own right hand punch. If the opponent parries our punch, then we have several options, the first of which is following up with a left hand punch (step 3). 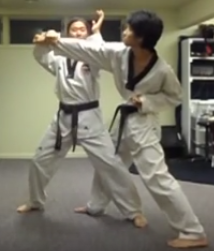 In other words, almost every set in Hwa-Rang begins with the opponent parrying your right hand. An example of a pure alternative follow-up design, for a form with 10 sets, is shown below. What is the benefit of such a scheme? Primarily this is just a way to organize and transmit ideas. However, by learning only one defense against a particular attack, you do not have the crippling problem of choice. You use the defense and then if it works, great, if it doesn't, then we have to ask questions. After the first set in Hwa-Rang there are multiple variables: Are you punching with your front hand or back hand? How close are you to your opponent? Did you succeed in grabbing and pulling the opponent's right arm? Did the opponent grab your arm? Each scenario provides different options. On the other end of the spectrum is a chain sequence, which better describes Choong-Moo. We assume the initial technique fails, and so we follow with a second one. Then if that fails we follow with a third technique, and so on. This process can continue through an entire form. Notice that I still added a couple branch points in this chain sequence. This is because a technique often can fail in multiple ways, so occasionally the form will provide more than one follow-up. These make the form difficult to interpret, but provide meaningful information about how your opponent may counter your technique. The key again is to ask questions about how a defense might fail. Most forms have a mix of the two structures, with the chains only going a few levels deep. In all three example cases, the form is designed to help you survive a single encounter, not multiple encounters with separate opponents. This is what is really meant when we say forms simulate a fight. A good form predicts the opponent's most likely response(s) and tells you how to deal with that. Examples of the starting attack include a haymaker, a straight punch, a lapel grab, a rear bear hug, a tackle, a football kick, or a shove. These attacks fall under "Habitual Acts of Violence", attacks you are likely to encounter in a self-defense scenario. The opponent may throw additional attacks as a counter to your techniques, but under this guideline you will never be attacked by a new opponent. I suspect not all forms are built this way. Po-Eun might be an exception. But this is a good starting point for analyzing forms. I believe the old method of keeping form applications secret is out of date. We live in the age of the internet where fighting knowledge is at one's fingertips. What's more, we do students a disservice when we teach them impractical applications for their forms. ITF taekwondo in particular bills itself as a self-defense art. So why not study the forms a little deeper? And if you want to study taekwondo as it was historically developed, isn't it worth studying the whole art, locks and throws included? I received some comments about using the palm pushing block against a punch. This is one of two applications shown in volume 10 pages 141-3 of the Encyclopedia of Taekwon-Do. The other application is against a side kick, which is not an attack I expect to face in a self-defense situation. The idea is that an untrained fighter is likely to over-commit to a punch, so you side-step the attack and push their upper arm or shoulder. If they do not over-commit then the push becomes merely a parry. Of course, no one throws a karate-style punch in reality, nor do they stand still waiting for you to punch. I would modify the above application such that the opponent is facing your front, and that you grab and pull the opponent's arm. Another comment was that the ITF forms are not meant to be fighting templates. Who said this? Not General Choi. In his 1965 book he writes. Jhoon-Rhee also stresses the logical nature of the form. Taekwondo pioneers were clear that forms were meant to convey fighting principles. This is not to say that performing forms makes you a good fighter, but the entire point of forms is to record and transmit ideas which you may use in a fight. Another comment was that forms are only for practicing movements. But you don't need a form to do that. We already do that in basics. My view is that in basics we practice movements with multiple possible applications, but in forms we see examples of how those movements may be used. An article that covers this in more detail is An Open Letter to Bunkai Researchers, although some of the points do not apply to taekwondo forms. Some assert that the only purpose of a bending ready stance is to set up a side kick. The problem with this logic is that not all side kicks are set up with the stance, and in Gae-Baek the stance is used without being followed by a kick. I read one taekwondoin state that the purpose of the stance was to "look intimidating". Needless to say, I disagree. A universal rule for slow motion movements has proved elusive. Another explanation I have read is that there is a detail besides power and speed needed to make the application work. But this too does not appear to be a universal rule. Although taekwondo's most obvious influence is Shotokan karate, if you study the books of General Choi and other early "Korean Karate" writers you'll find that they incorporate grappling techniques into their curriculum, particularly in the area of self-defense. Although there is grappling hidden in karate kata, most early taekwondoin trained in the Shotokan school which did not teach it. So where did all these throwing and locking techniques come from? One obvious source was Judo/Jujitsu. 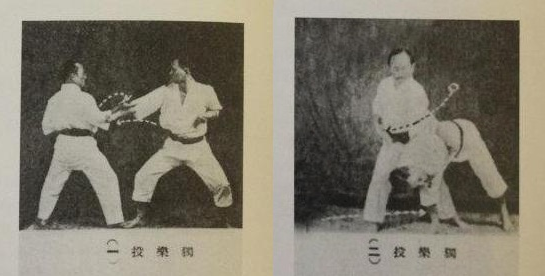 Gen. Choi's books contain signature Judo throws, including the famed inner-thigh lift throw (uchi mata). 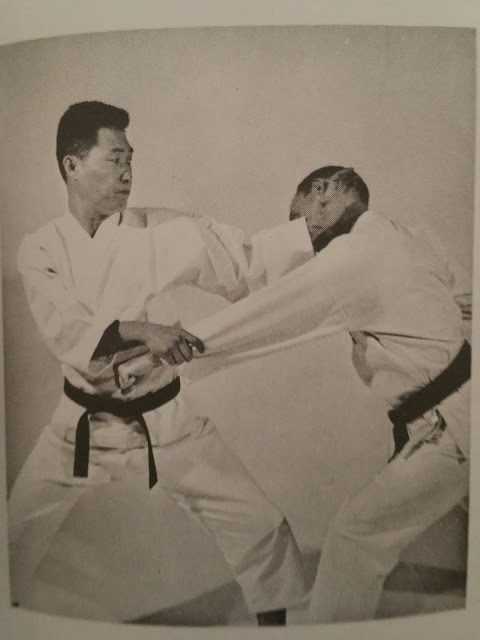 Two locking techniques, an outer-wrist throw and standing armbar, from Choi's 1965 book. Historically this makes sense. Judo was well-established on the Korean peninsula before karate. But the connection runs deeper than most taekwondoin realize. All of the early kwans (schools) likely incorporated Judo into their curriculum. One kwan, the Ji Do Kwan, actually began as a Judo school (Yun Moo Kwan) before adding on karate. Although the grappling aspects of taekwondo were gradually deemphasized, they were never completely forgotten. The Encyclopedia of Taekwon-Do (ITF) and Kukkiwon Textbook (KTA/WT) still contain sections on throws and locks, and taekwondo schools that focus on self-defense teach them. But what many don't realize is that various Judo techniques were encoded into the forms, with some portions being directly influenced by old Judo self-defense sets. This can be seen in the first three ITF forms created: Hwa-Rang, Choong-Moo, and Ul-Ji. These forms, made in 1955-6 by Gen. Hong Hi Choi, Lt. Nam Tae Hi, and Sgt. Han Cha Kyo, reflect a three-level division of fighting techniques. Hwa-Rang focuses on the controlling the arms. Choong-Moo focuses on attacking the base. Ul-Ji on attacking the head. Due to this, the three forms contain Judo locks, Judo throws, and at least one choke respectively. Choong-Moo is especially relevant here because it encodes several Judo throws. These throws appear in various karate kata, but most of them are represented differently. Furthermore, Choong-Moo utilizes chain techniques, where if one set fails you can follow with the next set in the form. This suggests actual knowledge of the throws, not just happenstance. The influence of Judo also explains some of the changes made to karate movements. Taekwondoin, ignorant of most of the applications behind kata, retrofitted certain movements and sets to fit Judo techniques. One example of this is the ITF version of the twin block, which commonly represents a hammerlock. This is why the front first points outward (the Shotokan version points inward) and why you often perform a wide turn into the movement. Similarly, the circular block from Won-Hyo was altered to sink down during the movement, as if scooping up a leg. This is its apparent application in several forms. Another example is the 1965 version of Hwa-Rang's twin block set. Although in the modern version we perform a twin block followed by an upward punch -- like in Heian Nidan -- in the original version step 5 was a back hand outer-forearm block, not upward punch, with the right fist still coming towards the left shoulder. Why block in such a weird manner? The answer is that it wasn't a block, but rather an encoding of Judo's ude garami lock. Judo's ude garami in the 1965 version of Hwa-Rang. Note that the cross-arm setup for the twin block had not yet been invented. 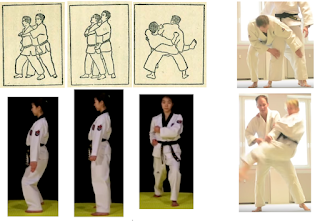 Finding Judo sets in the ITF forms should not be surprising because (A) Our self-defense curriculum is full of Judo techniques and (B) General Choi stated that the self-defense techniques are a logical application of movements acquired via the forms. So why wouldn't we find them? This is not to say that all the grappling in taekwondo forms is Judo. Clearly early taekwondoin must have had a rudimentary knowledge of karate grappling as well. Take the use of the pulling hand for example. Although this is usually taught as generating power, we see its use as a literal grab and pull as early as 1956, about the time the first forms were made. We see it in both public demonstrations and in books. Hence this karate "secret" was not really a secret at all. Many early taekwondoin, including General Choi, learned karate from Ginchin Funakoshi's Shotokan school. Kwae Byung Yoon trained Shito Ryu karate under Kenwa Mabuni, and Byung In Yoon trained Shudokan under Kanken Toyama. People debate whether taekwondoin learned any bunkai in these styles, but I see this as a red herring. Even if Mabuni and Funakoshi didn't teach bunkai in class, they published books exploring both bunkai and karate's grappling techniques, and these books influenced taekwondo forms. The KTA black belt poomsae in particular use sets straight from these books. In addition to bunkai examples, Mabuni's books also provide a framework for kata interpretation. He states that in kata you only face one opponent (not multiple opponents from different directions) and that turning in kata is turning relative to your current opponent. 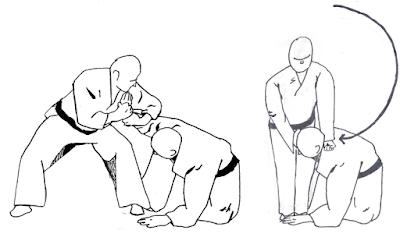 Taekwondoin used these principles in constructing their forms. Application for Jitae's bull block set, also from Mabuni's 1938 book. Remember that taekwondo pioneers spoke Japanese and trained karate in Japan, and that one kwan founder actually trained under Mabuni, so the fact that Mabuni's ideas are found throughout the KTA poomsae is not a coincidence. The Bubishi and Choki Motobu's books may be additional sources of techniques; Kwae Byung Yoon is known to have quoted the former . Ginchin Funakoshi also published some grappling techniques in his book Karate-Ko Kyohan (1935). There he presents his nine throws, using movements derived from kata. 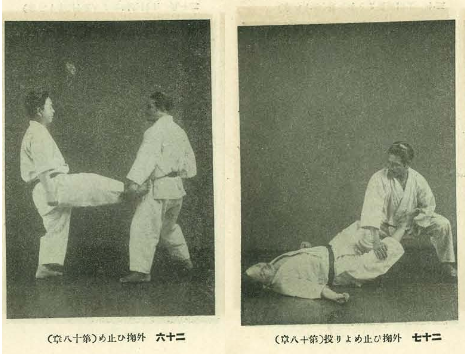 Funakoshi's "Spinning top throw". Essentially a spinning armbar takedown, it is utilized in various forms. Some of the early kwan founders had trained in Chinese martial arts, which also use forms and are less secretive about applications. Hwang Kee, the founder of the Moo Duk Kwan, trained Chinese arts while living in Manchuria. Kee would go on to crate the seven Chil Sung forms. They draw elements from Karate, Tai Chi and Shaolin Long Fist. You can view a performance of Chil Sung Il Ro here. Finally, given that many early taekwondoin crossed-trained in Judo, it's unlikely that they did not notice the grappling techniques contained in karate kata. Ex-karateka who take up a grappling art often have this "a-ha" moment when they realize a throw or lock exists in their kata. MMA fighter Eric Henry stated in an interview that he didn't understand kata until he took up wrestling. The key point here is that the use of the pulling hand, grappling applications for kata movements, and the basic logic of kata design was not some secret that taekwondoin did not know about. The fact that the KTA black belt poomsae not only include but expand upon these ideas is strong evidence of this. There is a distinction between early taekwondoin knowing the general concept of kata applications vs actually knowing the specific applications ingrained in various kata. 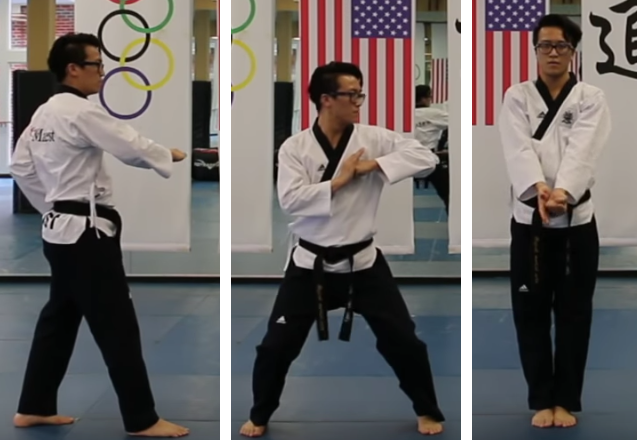 Taekwondo forms are not just remixes of karate kata. Most of the sets are original, and the sets taken from karate kata are usually altered. It is often claimed that Po-Eun is based on Naihanchi. But while the emblem and a few movements from Naihanchi are borrowed, the sets are all different. The KTA poomsae Pyongwon also uses the emblem and some movements from Naihanchi, but for some reason avoids the comparison. It is better to say that Po-Eun takes some inspiration from Naihanchi, mixing a few retrofitted movements with the creators' original ideas. The ITF form with the closest resemblance to a karate kata is Won-Hyo, which is based on Heian Nidan. But even Won-Hyo makes alterations, such as the addition of a ready position. Again, the alterations are best understood in terms of retrofitting. Taekwondoin did not know the original meaning of Heian Nidan's twin block set (neither do modern karateka), so they invented their own applications for it and altered the set as appropriate. This is why different variations of the twin block set appear in Won-Hyo, Palgwae 4, 1965 Hwa-Rang, 1983 Hwa-Rang, and Taebaek. Taekwondo forms contain substantially more kicks than their karate cousins. I was surprised to learn that roundhouse kicks appear in no Shotokan kata (excluding the ground kicks in Unsu), and only in one KTA poomsae, Taeguek 6. In contrast; Hwa-Rang, Choong-Moo, and Ul-Ji each contain roundhouse kicks; as do some later patterns such as Gae-Baek and Choi-Yong. Moon-Moo and Juche contain many advanced kicks, and the KTA poomsae have their share of power kicks as well. Kicks were no doubt added to make the forms more Korean, in homage to the native kicking art of Taekkyeon. But there is a bit of cleverness going on here, in that techniques useful for sport sparring are also being practiced in a manner relevant to self-defense. Other kicks have a similar cleverness to them. Taekkyeon's twisting kick becomes an oblique kick to the knee. Spinning kicks become inside leg reaps. 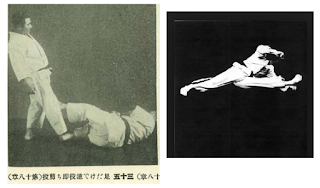 Even that crazy split kick in Juche, while meant to be visually impressive, may be used on the ground as a knee bar takedown, a technique that also appears in Mabuni's 1938 book. Juche's two-direction kick is also present in Mabuni's book. It is used on the ground as a kneebar takedown. The ITF forms were made collaboratively by 10+ Korean commanders, with often multiple commanders working on a single form. Gen. Choi's role in their creation is difficult to ascertain because different interviews contradict each other: supporters of Choi play him up as the genius behind it all, while detractors of Choi claim he was just the organizer. The likely truth is that Choi commissioned and conceived the basic design of the forms, but relied on the collective martial arts knowledge of his subordinates to figure out what worked. The original 20 ITF forms were made over the span of a decade. Their creators were experienced martial artists who practiced hard style, military taekwondo. Some of these men, such as Nam Tae Hi, had killed actual enemy combatants in melee. I am saying this to point out how illogical is it to say the forms are just random arrangements of karate movements, as is sometimes asserted. When was the last project you spent a decade working on? It is also illogical to suggest that impractical block-strike applications, such as using the U-shaped block to stop a vertical stick or a palm upward block to lift a punch, are the "real" ones. We will get to why these bad applications were promoted in a moment. We can apply a similar logic to the KTA poomsae, which were made by representatives of the nine kwans. Why would you create a form with no logic behind it? Even if the logic is rudimentary, something should still be there. These men were all proud of the martial art they studied and wanted it to be effective. You may still think the applications within poomsae are impractical, but they cannot be random or without meaning. How the Applications Became "Lost"
1) Carry over of karate tradition. Taekwondoin taught the forms the same way karate schools taught them: with block-strike applications only. The jump is Toi-Gye is said to be jumping over a stick sweep, for example, which is the same explanation karate textbooks gave for the jump in Heian Godan. The idea was that you did not teach form applications to just anyone, only to dedicated students. 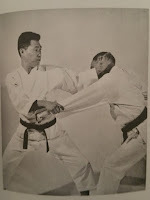 And given that the Oh Do Kwan was a military kwan now being transitioned into a civilian art, Choi and his commanders may have been reluctant to share the techniques with the general public. 2) Asymmetric distribution of knowledge. Since different commanders made different forms, no really knew the true applications to all of them. Hence when General Choi dispatched his black belts to different countries, no one could reasonably teach the applications. So they stuck to basic block-strike interpretations. 3) Choi lost his black belts. After the move to North Korea, General Choi was abandoned by most of his senior black belts, including the commanders who helped create most of the forms. This is not to say Choi had zero deeper application knowledge, but he probably had incomplete knowledge and wanted to avoid public embarrassment. (Stuart Anslow argues that Choi's subordinates may not have even told him the applications, again to avoid the embarrassment of a subordinate teaching Choi). The objectives of Taekwon-Do are to cultivate character, to trim and slim the body, to bring out one's strong strengths, to display graceful techniques, and to cultivate one's mind. What? Slim and trim the body? Self-defense and fighting are not even mentioned! This is in sharp contrast to how taekwondo is defined in Choi's 1965 book Taekwon-Do: The Art of Self-Defense. Translated from Korean, "Tae" (t'ae) literally means to jump or kick or smash withthe foot. "Kwon" denotes a fist-chiefly to punch or destroy with the hand or fist. "Do" means an art, or way or method. Thus taken collectively "Taekwon-Do" indicates the technique of unarmed combat for self-defence, involving the skilled application of punches, flying kicks, blocks, dodges and interceptions with the hands, arms and feet to the rapid destruction of the opponent. At some point in his life Choi ceased to promote taekwondo as a fighting art. He restyled it into fitness and self-improvement instead. He was also obsessed with standardization and making his art looks distinct from karate (and KTA taekwondo), culminating in the addition of the sine wave. This is something uncomfortable for many ITF taekwondoin to admit, but the version of the art we learned is far removed from a practical fighting art. 5) Intense sportification. In the case of the KTA poomsae, the race to get into the Olympics led to a deemphasis on traditional aspects of the art. To make taekwondo look like a distinct sport, kicking techniques were emphasized. Hand techniques were downplayed and grappling techniques all but forgotten! Even poomsae performance became a sport. In this climate, there was little interest or use for poomsae applications. 6) The 3,000 year old myth. The KTA downplayed taekwondo's karate origins and instead promoted the idea it was an ancient Korean art. Questions about the origins of poomsae were actively discouraged, perhaps to avoid the connection with contemporary karate manuals. The reliance on Judo/Jujitsu may have been downplayed for the same reason. In contrast, the connection with Taekkyeon was emphasized, despite the fact that Taekkyeon's contribution was a minor one. As further evidence of this, this three-level division of applications was used in the fourth pattern, Sam-Il, as I discussed in The Study of Sam-Il. The division is not absolute: Choong-Moo begins with an attack to the neck and Ul-Ji contains many locks, but the overall strategy of the two forms is nonetheless throws and attacks to the head respectively. The cross-arm setup for the twin block was a later addition. 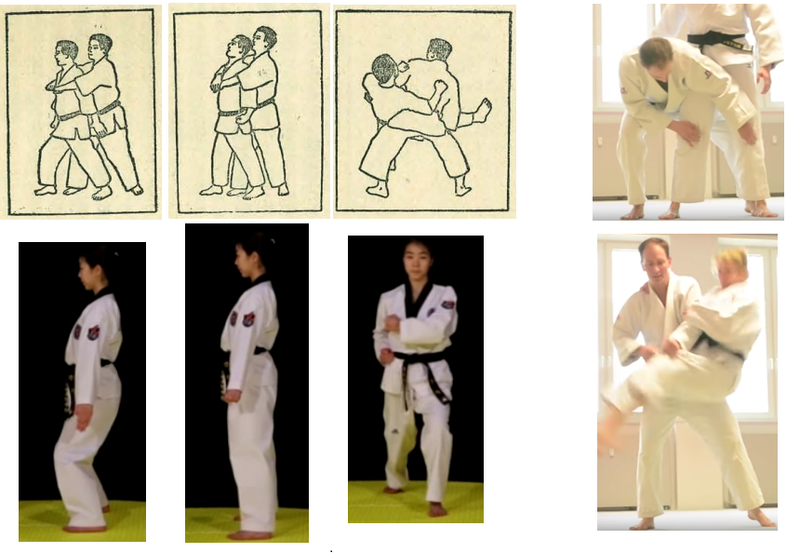 In Choi's 1965 book both arms move up in parallel starting from the hip. This is also indicative of the hammerlock application. Only Hwa-Rang appears to have been altered to take advantage of the new cross-arm setup. These [self-defense] techniques are the logical application of various movements acquired from patterns [forms], sparring, and fundamental movements to be used against a sudden attack. Source: Andreas Quast in his contribution to the 2016 edition of Bubishi: The Classic Manual of Combat. The back leg sweep is also in some Taekkyeon forms, where the performer will swing one or both arms in the opposite direction of the roundhouse kick. However, I am not aware of a direct relation between Taekkyeon forms and taekwondo forms. There are more complex reasons for this. It was believed that by sharing form applications with outsiders, this would give away your techniques and thus make it easier for opponents to defeat you. Many kata are deliberately built to be hard to interpret. Taekwondo seems to have carried over this idea, as the creators went to absurd lengths to disguise each technique as a block or a strike; e.g. using the double arc hand block to catch a throw pillow. Some of the forms are also quite brutal at times, with applications such as dropping the opponent onto their head or attempting neck breaks. While part of the heritage of military taekwondo, these are unethical for civilian self-defense. I am writing a summary of my research over the past several years, sort of a bookend to this blog. It's so long that I am breaking it down into multiple parts, but I don't want to publish any of it until it's all done, so expect it within the next couple weeks. It will contain various example applications for both ITF forms and KTA black belt poomsae, but the major focus will be the internal structure of forms. Some of the earlier posts, particularly on Joong-Gun, have been taken down because I have retooled some of the ideas. Not sure whether I'll get around to revised versions. This will be my last applications post for the near future. The only other kind of "pushing block" is the palm pushing block, which like its name suggests to meant to push the opponent with the palm. This movement appears in no other ITF patterns. It is unique to Toi-Gye. Despite the stated purpose of a "pushing block" being to push the opponent off balance, the only application we ever see for this motion is blocking a kick. Similar motions used to push down an opponent -- such as the low knifehand guarding block -- are usually open-handed. Why the closed fists? And why is the inner-forearm used to block? I wanted to see where this movement came from. 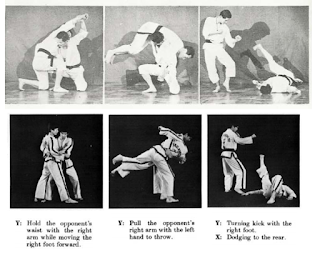 In General Choi's 1965 book Taekwon-Do: The Art of Self-Defense, he lists instructions for several karate kata in addition to the original 20 ITF patterns. 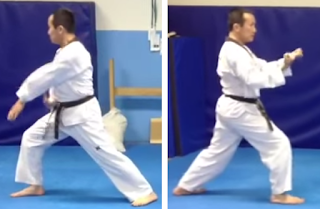 The low forearm pushing block appears in two kata: step 10 of Gankaku (which Gen. Choi calls "Ro-Hai" for some reason) and steps 10 and 27 of Tekki Sandan. I looked up youtube performances of the patterns and compared the "pushing blocks". Neither of these motions look like Toi-Gye. In Genkaku the outer-forearm is used. In Tekki-Sandan the inner-forearm is used, but it's in riding stance and the position of the back arm differs. So as far as I can tell, the motion is unique to Toi-Gye. Specifically, we use the pushing block to create a rear wrist lock, a police hold that appears in the Encyclopedia of Taekwon-Do (Volume 5, page 313). We follow with a knee strike to the opponent's lowered head, and then a throw via a head crank. We begin with the counter-clockwise turning W-block (mountain block), using it to create an armbar. 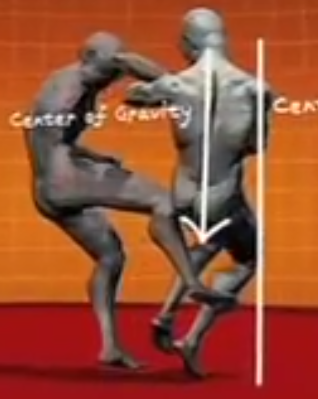 Notice how the tori lands his front leg in front of his opponent's right leg. This is important: we are setting up a trip. The armbar should be a forceful one, utilizing the 180-degree swing we perform in the pattern. This will knock the opponent's shoulder forwards. As you step in with your left leg, bend your opponent's arm such that their elbow is up, as in a hammerlock. Now you will switch hand positions: grab their left knifehand with your right hand. As you maneuver your arm into the low inner-forearm block, you will naturally curl your opponent's hand and bend their fingers in towards their inner elbow. Make sure to bend their arm behind their back, and grab their elbow with your right hand for control. This creates the rear wrist lock. Bending the opponent's wrist in causes them to reflexively bend forwards, so you can use both fists to literally push them forwards and to the ground. The direction of the wrist actually pushes them down to the right (towards their elbow), and so when combined with the trip they may fall onto one knee. If they don't fall, follow the pattern: grab the back of their head with both hands and knee strike their face. Then grab the head with both palms (left hand underneath, right hand on top) and crank it as you turn around into the knifehand guarding block , attempting to flip and throw the opponent by their head. A wrist lock application might seem too esoteric for some, but this is application that both (1) follows the pattern and (2) explains why it is called a "pushing block". This lock also appears in the Encyclopedia of Taekwon-Do, so I'm not pulling it out of nowhere. A head crank is a common application for the knifehand guarding block. If you move your two palms closer together, then moving from the setup to the block-proper mimicks grabbing and cranking the head.